With brick and mortar stores encroaching on the midnight release time for Black Friday sales traditionally reserved for online retailers, stores like Lenovo, who only retail online, are required to get even more competitive. And the Lenovo Black Friday coupon code for $500 dollars off the IdeaPad Y580 laptop is a great example of how to compete. CouponBuzz.com, an online coupon aggregate website, is featuring this Lenovo Black Friday coupon at the top of their webpage dedicated to hosting Lenovo coupon codes on a daily basis. With Black Friday approaching however, most of the deals consumers will see on this webpage will revolve around the significant savings available in this unique shopping season. Black Friday is a fabulous time of year to be in the coupon business. The Lenovo Black Friday coupon for $500 dollars off the IdeaPad Y580 laptop represents an impressive discount on one of their top-selling computers. The IdeaPad Y580 is a laptop that combines impressive graphics capabilities with high performance processing speeds and then adds in some seriously cool advanced multimedia features. Lenovo markets it as ‘built for speed’ with rapid boot times, fast software operations, and even faster data transfer via USB 3.0. The Lenovo IdeaPad Y580 also boasts a 3rd generation Intel Core i7 processor at 2.4 GHz, which powers its impressive performance speeds. It also comes standard with an NVIDIA GeForce GTX660M graphics card with 2 GB of memory, and a whopping 1 TB hard drive. The 15.6 display is backlit LED with 1366 x 768 resolution. Its 6 cell lithium battery guarantees long lasting battery life, and an HD webcam adds a nice touch to communication and gaming. 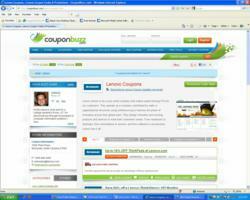 Online shoppers interested in the Lenovo Black Friday coupon for $500 off the Y580 IdeaPad can check out the jaw-dropping discount at CouponBuzz.com’s dedicated webpage for Lenovo coupons, located here http://couponbuzz.com/lenovo-coupons.html.